As You Like It is a beautifully maintained 2007 Chaparral 275 SSI, bridging the gap between a cuddy cabin and a small cruiser with an excellent blend of comfort, style, speed and maneuverability. 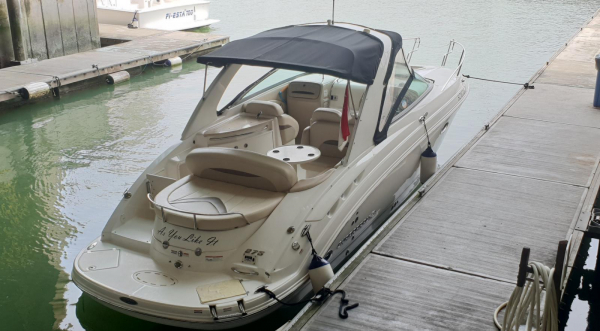 Currently berthed at Raffles Marina, As You Like It is ready for new owners, with a recently installed (August 2018) brand new 7.4L Mercruiser V8 engine. This allows her to easily hit 40 kts and cruise comfortably at 25-30 kts at a low RPM, meaning comfort for your passengers and economy for your wallet. Sorry! No similar Boat Found. I am interested in As You Like It of ID "1". Please contact me. TheBoatShopAsia provides competency courses, offers self-drive & skippered boat hire and runs Singapore's most active boating community. get the best of TBSA in your Inbox daily. Woohoo! Glad you're joining TBSA. Just fill in some details below and you can jump right in.